The Illinois Traction Building was built as a depot. 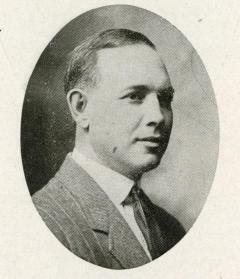 Joseph William Royer designed the building in 1913. The Illinois Traction Station, also known as the Illinois Traction Building, was originally the headquarters of the rail system. The construction was proposed in November 1911 by the Illinois Traction System; however it did not start until April 1913 and it was completed in December. It was designed by Joseph William Royer, a former graduate student from the University of Illinois who designed numerous significant buildings in the downtown area, and remarked a page on the architectural history of Urbana. At the time, William McKinley, the owner of the Illinois Traction System and Urbana's electric plants, operated the inter-city electric trains and streetcars throughout Illinois. 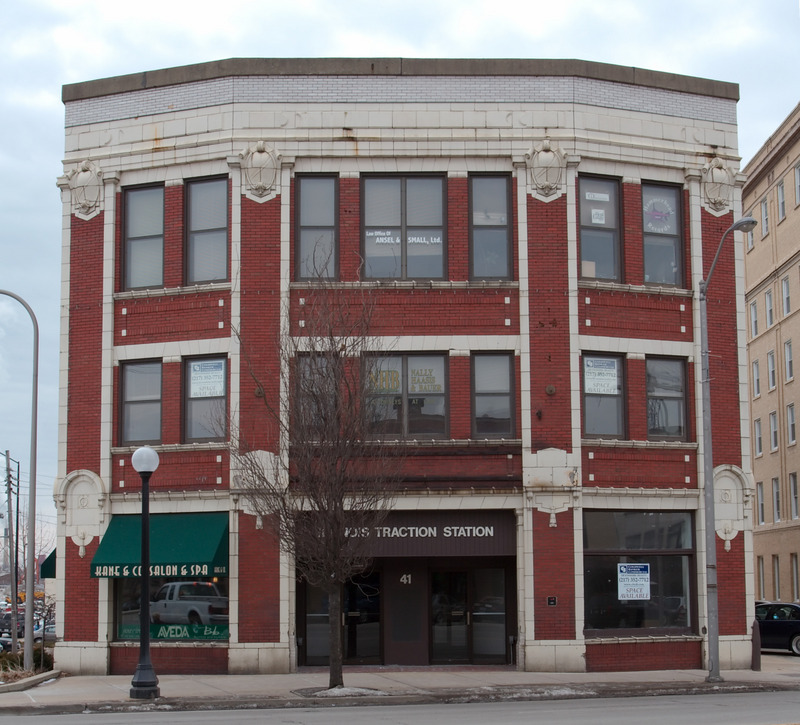 The traction building served as the terminal of a regional electrified railway system across cities within Illinois, including Danville, Champaign/Urbana, Peoria, and Springfield. The traction building was held as a passage and freight depot from 1931 to 1937 before street tracks and inter-city trains were abandoned in Champaign. In 1937, it served as an office building for the Illinois Power and Light Company until 1985. Afterwards, it was remodeled into an office building with several stores on the ground floor, and it continues in this use even today. The presence of the Illinois Traction Building was evidential of the success of McKinley's electrified railway system in the 1900s. At the time, the heavy duty interurban railway system with passenger and freight services was the main method of transportation for local commuters in many of the cities. The construction of the Illinois Traction Building, as one of the main headquarters of the Illinois Traction System, was unquestionably marked as a significant event in the development of Illinois. As a result, the Illinois Historic Preservation Agency approved and listed it as a National Landmark in 2006. Joseph William Royer chose a Chicago School style of architecture, and had his plans accepted November 1911. The Traction Building was designed to be not only functional, but also visually appealing. The building's interior was designed to accommodate both extensive passenger and freight business. While the structure's exterior is very detailed, with intricate ordainments carved into the side of the building. One of the more interesting things about the Traction Building is the floor plan. The plans show that William McKinley's office, the owner of the Illinois Traction System, was designed to be more luxurious compared to the other offices in the building. The office was significantly larger in size, and included its own private restroom. Another fascinating feature of the building is that each floor, including even the basement, has a vault located at the southeast corner. All of the vaults are located one above the other. The Traction Building was a three-story structure with a basement. It was originally a freight and passenger depot as well as the headquarters of the Illinois Traction System. There were passenger rooms on the first floor with platforms on the side of the building. It also contained a boiler room, a room with heating or steam generating equipment, in the basement and offices on the second and third floor. 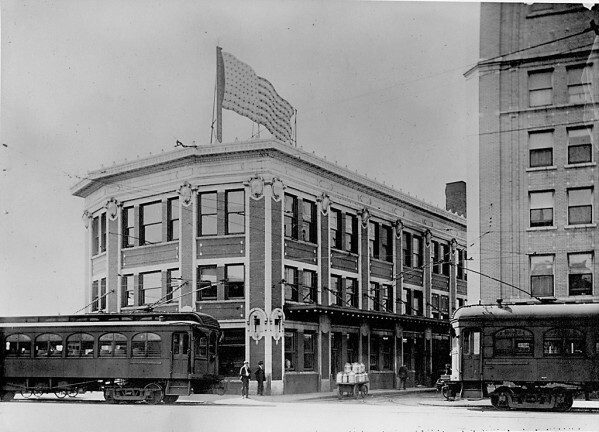 After it was abandoned by the Illinois Traction System and turned into a depot, it was adopted by the Illinois Power and Light Company as a business building. The original waiting room turned into an accounting room and the rest of the rooms remained as offices. After it was remodeled in 1985 there were two stores on the ground floor with additional offices on second and third floors. Born in 1873, Joseph W. Royer was raised in Urbana as he graduated from Urbana High School and eventually graduated from the University of Illinois with an Architecture Degree in 1895. A few years later, he became the city engineer of Urbana until 1906. Then, he formed an Architecture firm called Royer and Smith. Over the years, the name of the firm changed as his partner(s) changed. His firm mainly completed projects locally in the Champaign-Urbana area, although his work appeared throughout the midwest in Iowa, Indiana, and Wisconsin. He became one of the significant architects of the city of Urbana. 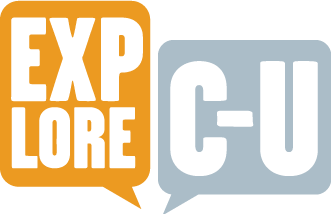 Bartels, Jacob, Ryo Mizuki, and Justin Sass, “Traction Building,” ExploreCU, accessed April 20, 2019, https://explorecu.org/items/show/312. Cuerda, Sasha. "Joseph William Royer." N.p., 06 Aug. 2012. Web. <http://webcache.googleusercontent.com/search?q=cache:B-b2kfhzQEEJ:urbanaillinois.us/residents/historic-urbana/100-most-significant-buildings/urbanas-architects/joseph-william-royer+&cd=9&hl=en&ct=clnk&gl=us>. Friedman, H. George, Jr. "Twin Cities Traction - Chapter 15." Twin Cities Traction - Chapter 15. N.p., n.d. Web. 20 Nov. 2013. <http://www.cs.uiuc.edu/~friedman/champaign-urbana/Chapter15.htm>. Brehm, Kara. “Illinois Traction, 1909,” ExploreCU, accessed December 13, 2013, http://explorecu.org/items/show/204. Matkovszki, Ilona. "The Joseph W. Royer Arts and Architecture District." N.p., n.d. Web. <http://webcache.googleusercontent.com/search?q=cache:frvs3NySfyIJ:urbanaillinois.us/sites/default/files/attachments/royer-district-brochure.pdf+&cd=8&hl=en&ct=clnk&gl=us>.